Looking for an easy way to complete export documents? Today is your lucky day. Shipping Solutions® makes completing export forms simple, accurate and five-times faster than the tedious way you’re doing it now. 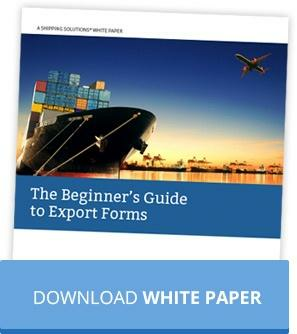 Eliminate the hassle of manually completing your export forms. Our EZ Start Screen helps you automatically complete more than a dozen export forms. With Shipping Solutions automation, you can complete your export documents up to five-times faster than your traditional manual process. Instead of entering the same information over and over again, you enter information in only one place. That makes you less likely to make costly mistakes. Are you sure you’re using the right documents for your exports? When you know how to properly prepare your export paperwork, your goods will ship on time, you’ll get paid more quickly, and you’ll stay compliant with export and import regulations. Find out how by downloading this free guide. Produce dozens of export forms quickly and accurately without hassle. Import orders from your company’s accounting or ERP system. File electronically through the Automated Export System (AES). Screen your shipments against current export regulations to avoid fines and other penalties. Email export documents directly from Shipping Solutions. Send your shipping information to UPS WorldShip or FedEx Ship Manager software for your parcel shipments. Join more than 3,000 successful exporters. They've all used Shipping Solutions to create their export forms. "We use Shipping Solutions by InterMart. Using this software greatly reduced the amount of time it took us to generate Word or Excel based documents. It also provides for consistency of information between the document—no more incidental typos!" Get real live support from friendly Minnesotans. You betcha!